The social networking giant Facebook, which started releasing its own transparency report last year, just released its third transparency report for the first half of 2014. It has been observed that the Indian government is increasingly asking the social site to censure the posts by its users, and was instrumental in blocking or restricting access to 4,960 pieces of content during the first six months of 2014. Though the US government outranked its Indian counterpart when it came to seeking information about users, they did not eventually restrict access to any content even after their investigations. The US officials made 15,433 requests for information on those using the networking site and these enquiries affected 23,667 accounts. India, with 4,559 requests affecting 5,958 accounts was placed second on the list. 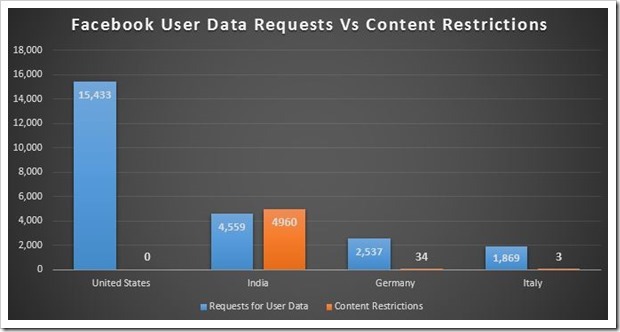 While Facebook complied with almost 80% requests for information in the US, the figure was a much lower 51% in case of India. When does Facebook provide User Data? Even if the request is come from senior government authorities, Facebook needs to have a letter from court of law to furnish any of the user data. Though Facebook did receive requests for user information from officials of most of the 83 countries for which it has released its numbers, not many governments actually went ahead with blocking content. That is evident from the figures for USA. Inspite of them leading the list for seeking information, the content restrictions from their enforcement agencies was 0! India, on the other hand, led on account of placing restrictions by blocking access to 4.960 pieces of content. Pakistan and Turkey were the only two other countries that had blocked Facebook content. While Turkey blocked 1,893 pieces of content, Pakistan had censored 1,773 of them. “We respond to valid requests relating to criminal cases. Each and every request we receive is checked for legal sufficiency and we reject or require greater specificity on requests that are overly broad or vague,” Facebook noted in its report. Chris Sonderby, Facebook Deputy General Counsel, said that the number of requests was gone up compared to the last six months of 2013. “In the first six months of 2014, governments around the world made 34,946 requests for data – an increase of about 24 per cent since the last half of 2013. During the same time, the amount of content restricted because of local laws increased about 19 per cent,” said Sonderby. The number of pieces of blocked content by Indian officials has risen yet again. 4,765 pieces of content had been blocked during the last six months of 2013 as compared to 4,960 for the same duration this time.